Christmas is just two weeks away so time for a winter manicure that is fit for Christmas too. This idea came to me while I was playing around with some crackle polishes and I really liked the look so I decided I needed to do a full on manicure like that. It was actually a very easy look to achieve. And finally to take things a step further a coat of China Glaze Luna. Topped everything off with a coat of Seche and I was good to go. I really liked this manicure and I was very excited as I came up with the idea by mistake. If you wanna try it too, why not enter my Festive Giveaway for a chance to win Isadora Graffiti Nails in Subway Green amongst many other goodies. Deadline is tomorrow. I really love this look, its Icy! I need to get my hands on a crackle polish! This looks so awesome!!!! It's even better than I imagined when you told me about it. I love the colours you chose! CC Take Me to Your Chateau has been on my wishlist for ages now and your mani hasn't helped LOL. I love thisss!! Sometimes the best ideas are by mistake. Very cute. 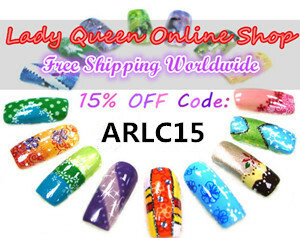 amei suas unhas , muitos lindas qual o segredo para manterem elas assim? 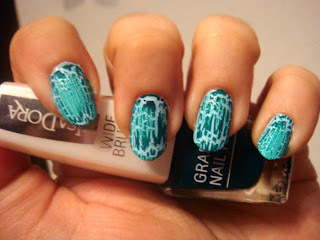 Glitter on top of crackle--great idea! 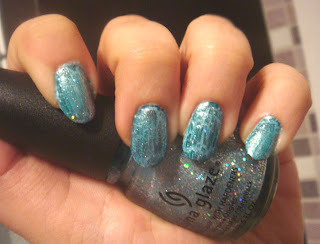 oh I must have China Glaze Luna now, it is so gorgeous!!!! Thank you ladies, I am glad you liked this idea!